FactCheck: do 679 of Australia’s biggest corporations pay ‘not one cent’ of tax? … 679 of our biggest corporations pay not one cent of tax. – Australian Council of Trade Unions (ACTU) Secretary Sally McManus, address to the National Press Club, Canberra, March 29, 2017. Speaking at the National Press Club in Canberra, Australian Council of Trade Unions (ACTU) Secretary Sally McManus called for an increase to Australia’s minimum wage and criticised the Fair Work Commission’s recommendation to cut Sunday and public holiday penalty rates. McManus said that “679 of our biggest corporations pay not one cent of tax”. According to the most recent ATO Tax Transparency Report, 679 companies with more than $100 million in income paid no tax in Australia in 2014-15. The list includes such household names as Walt Disney, Sydney Airport, Qantas, Origin Energy and News Australia. These companies can collectively be considered to be amongst the biggest operating in Australia – both in terms of income, and the prominent position they enjoy in the public eye. Some of them are not Australian owned, and they may pay tax in other jurisdictions. However, they all operate in Australia, generate revenue from the spending of Australians and utilise existing infrastructure – like roads and ports – that were paid for by Australians. So there’s something deeply unfair about a system which allows them to not pay any tax in Australia. The ACTU also provided The Conversation with a spreadsheet listing the corporations it said had paid no tax. entities with tax payable under the minerals resource rent tax. The report includes each company’s name, total income, taxable income, and tax payable. For the purpose of this FactCheck, the relevant information is the tax payable by each of these companies. By looking at this data, we can see which companies didn’t pay tax in 2014-15, the most recent financial year for which this information is available. How many companies don’t pay tax? There are 1,904 companies included in the ATO’s 2014-15 report. Of those, 678 – or 36% of the companies listed – had no tax payable. My count – 678 – is slightly different to McManus’s count of 679, and to the figure the ATO quoted on its pie chart here (the ATO has since corrected its report to reduce the number of nil tax payable taxpayers by one to 678). The ACTU provided The Conversation with a spreadsheet listing the 679 companies that, in their view, paid no taxes. When I compared my count with the ACTU’s, I noted the ACTU included a company that I did not, a company named Tal Dai-Ichi Life Australia. In the report I downloaded from the ATO website, Tal Dai-Ichi Life Australia is recorded as having total tax payable of A$56,171,148 for the 2014-15 financial year, so it shouldn’t be included in the count of companies that paid no tax. Nevertheless, the difference is obviously minor. McManus was essentially correct. Why do some companies pay no tax? In general, there are two reasons why corporate companies pay no tax in Australia. The first is that some companies are not making any profit. The concept of “total income”, which is used to identify the companies included in the ATO report, relates to revenue – not profit. So, a company can have income (or revenue) of more than A$200 million, but that doesn’t automatically mean it has made a profit. Its losses or outgoings may outweigh its income. Only companies making a profit have to pay taxes. Many of the companies that didn’t pay tax in 2014-15 were those in the energy/natural resources and manufacturing sectors – two sectors that were experiencing a downturn in that year and where profit margins were shrinking. 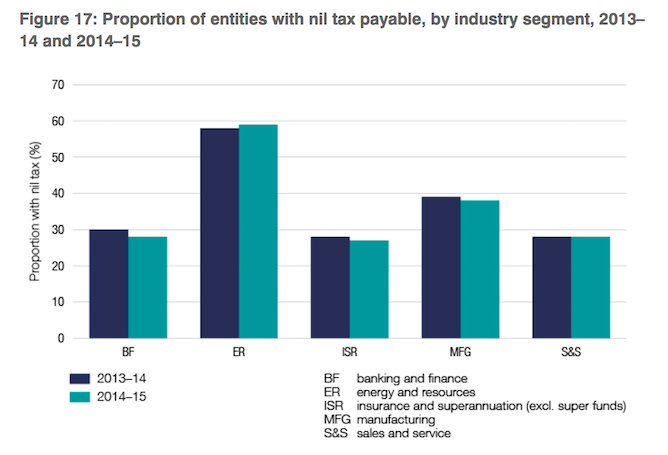 Proportion of entities with nil tax payable, by industry segment, 2013–14 and 2014–15. The second reason could be tax avoidance or profit shifting. These situations arise when companies take advantage of the international tax system to reduce the amount of tax to be paid. For instance, companies may set up complex ownership arrangements that allow them to redirect profit to countries with lower tax rates. While not necessarily illegal, these situations are closely monitored by the ATO to ensure that Australia receives its correct share of tax under international tax rules. Sally McManus’ claim that “679 of our biggest corporations pay not one cent of tax” was essentially correct. According to ATO records, 678 of Australia’s biggest corporations didn’t pay tax in Australia in 2014-15. McManus’s figure of 679 included one company that did have tax payable in that financial year. But in percentage terms, the difference between 678 and 679 is negligible. This is a sound FactCheck. The ATO’s annual corporate tax transparency reports can provide useful insights to inform public debate regarding how effectively our tax system is working. As the author rightly points out, the information must be used with caution. There are legitimate reasons why a company with substantial income does not have to pay income tax. For instance, it may make a loss in that particular year, or has substantial carried forward losses from previous years.